Prof. Linda Doyle with Cllr Declan Hurley, the Mayor of the County of Cork. 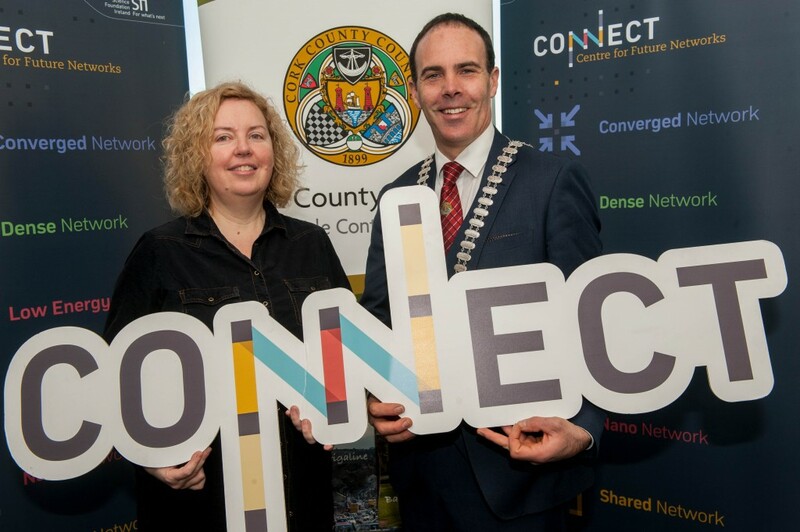 Representatives from over 60 companies in the Cork region attended CONNECT in CORK, an information morning for potential industry partners, at Cork County Hall on 29 November 2017. The goal of the event was to introduce CONNECT’s research themes to locally-based companies with a view to establishing new research partnerships. The gathering was hosted in partnership with Cork County Council. Four CONNECT partners – Brian Coffey (Analog Devices), Padraig Hennessy (Terra Liquid Minerals), Riona Sayers (Teagasc), and Ian Wheelock (Arris) – provided testimonials of their positive experience of working with CONNECT. CONNECT researchers also spoke at the event with Prof. Linda Doyle providing an overview of the work of the Centre and outlining funding opportunities for companies interested in collaborating on research projects. Dr Alan Mathewson and Dr Alan O’Riordan described their sensor research for on-farm diagnostics conducted at Tyndall National Institute. Professor Dirk Pesch from the Nimbus Centre at Cork Institute of Technology introduced ENABLE – a new smart communities research programme which will be launched in January 2018, and Professor Cormac Sreenan, Head of the Department of Computer Science at UCC and Deputy Director of CONNECT, described the use of artificial intelligence and aerial drones in search and rescue missions. Dr Brendan O’Flynn described the applications of Pervasive Nation, CONNECT’s Internet of Things testbed.